Looking out at the blue and green volcanic lakes of Sete Cidades (photo: Emily Mcauliffe). A typical summer's day in Ponta Delgada. 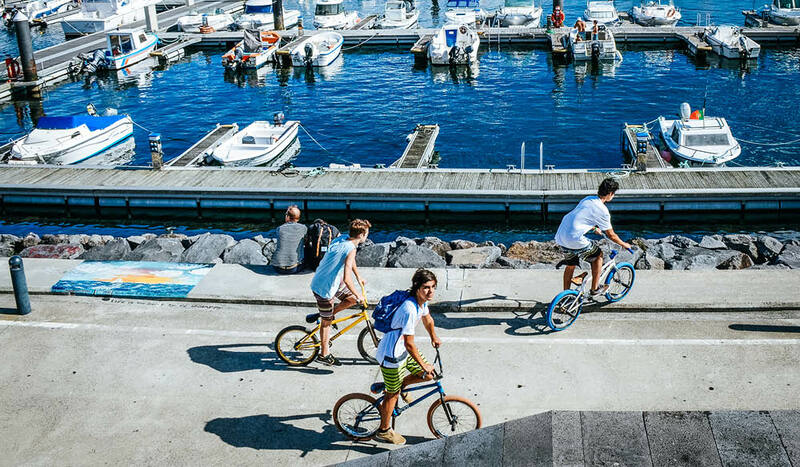 The pace is leisurely at the São Miguel modern waterfront precinct. 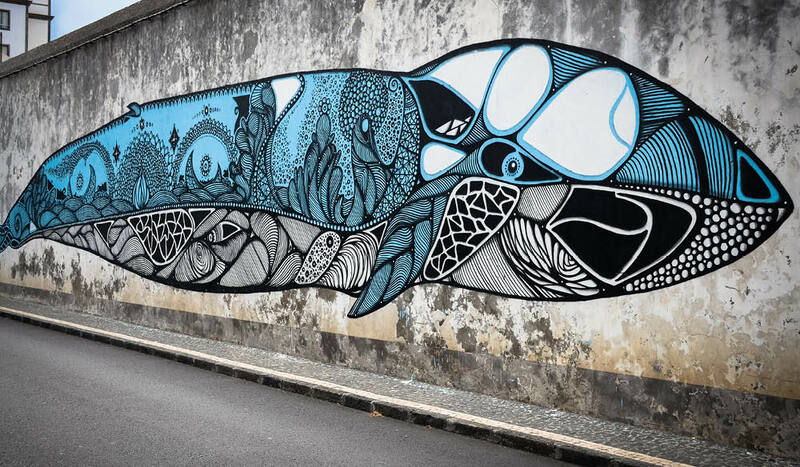 Street art in Ponta Delgada (photo: Emily Mcauliffe). 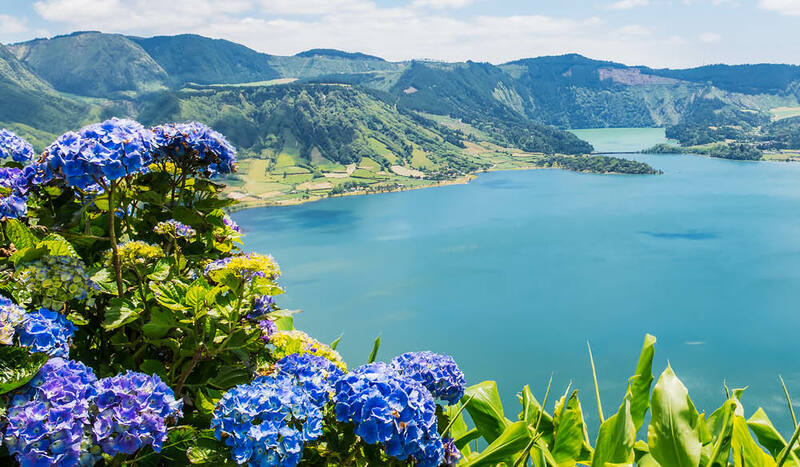 Few places in Europe have dodged the march of mass tourism, but Portugal has quietly kept the ace of paradise up its sleeve, and the Azores are now more accessible than ever, writes Emily Mcauliffe. I’m almost convinced we’re making a water landing when my plane gently bumps onto the runway. Outside I see nothing but blue – just blue sky dissolving into a blue sea – until a steady U-turn brings the tarmac into view. The cabin inhales a rush of humid air as we disembark, and my first glimpse of São Miguel’s lush landscape makes it obvious why the island is affectionately nicknamed Ilha Verde or ‘Green Island’. 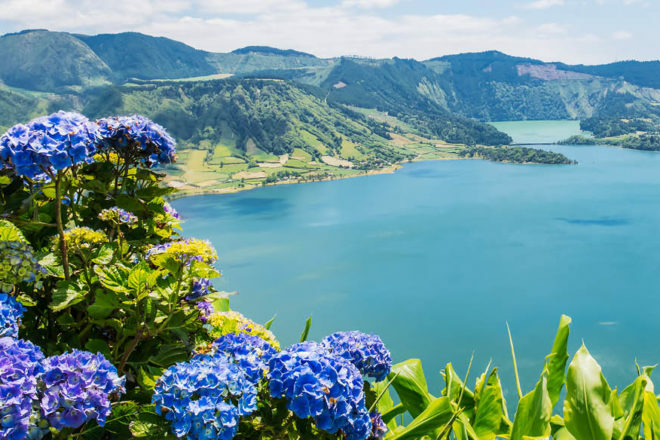 São Miguel, with a population of around 140,000, is the largest and most developed of the Azores’ nine-island archipelago that stretches across 600 kilometres in the North Atlantic. A two-hour flight from Lisbon, the remote landmass was chanced upon by Portuguese explorers in 1427 and went on to become a strategic food and water collection point on subsequent voyages. During these stopovers the Portuguese planted seeds collected in the Asia–Pacific, which thrived in the volcanic soil and humid climate, turning the island into a verdant paradise. The wild landscape didn’t particularly appeal to the greater Portuguese population however, who were cajoled into developing the island with offers of free land or by mandate of the monarchy as punishment for petty crimes, not dissimilar to Australia’s own convict transportation history. Over the ensuing centuries, the Azores developed prosperous agricultural and fishing communities and the population of Ponta Delgada, the administrative capital of the archipelago’s autonomous government, grew to 70,000. However, until almost three years ago flights to the Azores were controlled by an airline duopoly, making travel to and from a costly exercise. Things changed in 2015 when the skies opened to other carriers and airfares became competitive. This improved accessibility has prompted tourism growth, but for the most part the Azores feel almost completely untouched. For how long though is another question. 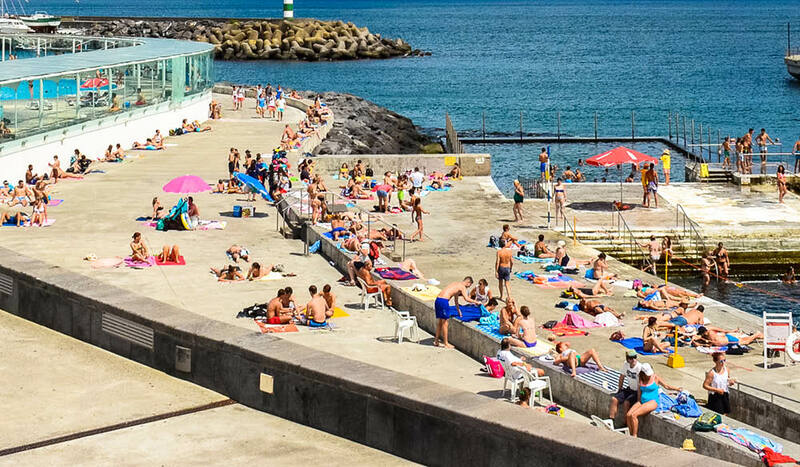 A typical summer’s day in Ponta Delgada. From both a tourism and geological point of view, São Miguel is roughly divided into east and west (the island is a fusion of two volcanic massifs), with day tours covering key attractions of each respective half. Ponta Delgada makes a convenient travel base and is where I join local guide José to explore the west. As we drive out of the city, José points to a house up ahead. “I live there,” he says. “You’re welcome to visit any time.” As I quickly discover, this friendly nature is characteristic of the Azoreans, who exude unwavering kindness and warmth. We notice this at the Vieira ceramic workshop and Mulher do Capote liquor factory where staff explain their products with humble pride, and farmers bumping along in tractors tip their hats as we traverse the undulating countryside in search of the best viewpoints. I reach for my cardigan as our van twists high up into the mountains. Glimpses of the valley below flicker through the trees before José stops at a clearing. As we step out for a photo, however, a blinding fog floods the valley and we lower our cameras in disappointment. “Wait,” says José with a knowing smile. And sure enough, the fog slinks over the mountain within moments to reveal a picture-perfect patchwork of green pastures stitched together by rows of blue hydrangeas. These hydrangeas have become a defining feature of São Miguel since being introduced as aesthetically pleasing paddock boundaries. I mean, why have fences when you can have flowers? While the local government handles the hydrangeas’ upkeep, the iron-rich soil gives the petals intense colour. During the warmer months the hills are also sprinkled with yellow and red wildflowers, making São Miguel a photographer’s dream. One of the most photogenic viewpoints is Vista do Rei, which looks across the blue and green lakes of Sete Cidades. The volcanic lakes’ stark colour difference is merely an illusion of depth and reflection, but legend tells of a love-struck princess and shepherd who cried the colour of their eyes when the King quashed their union. Despite their tranquillity, the Azores are known to be restless, agitated by subterranean tectonic forces. Five of the Azores’ 23 active volcanoes are located on São Miguel, with the island’s volcanic heartland found in the town of Furnas. To explore this natural phenomenon, I join another local guide, Miguel, on my second day for a small group tour of the east. As we set off from Ponta Delgada, Miguel says that while most of São Miguel’s seismic events go unnoticed, they have cumulatively taken their toll on the island’s infrastructure, meaning few original buildings remain. This explains why Ponta Delgada’s cityscape appears more modern than mainland Portugal, with most buildings constructed during the Baroque period using the island’s dark volcanic stone. While much of the population resides in the quaint capital, our next destination, Furnas, is a popular holiday spot for locals. Given its neat streets and manicured gardens it’s easy to see why, but curiously, the landscape is also punctuated with giant clouds of steam. As we walk towards the town’s naturally bubbling cauldrons, Miguel draws our attention to a series of taps protruding from a stone wall, serviced by the town’s geothermal activity. We taste the water streams – a mix of warm, cold, still and sparkling – and dip our toes in the ‘foot washer’, which runs at a piping 60°C. While the hot water is now recognised for its spa qualities, the springs weren’t always well regarded. As we peer into the rapidly boiling Caldeira do Asmodeu, Miguel explains that its name references the devil. Being highly superstitious and religious, early settlers believed Furnas to be the gateway to hell and only populated the area as a last resort. Over time, however, the residents began to embrace their endless hot water supply, using the caldeiras for softening wicker to make furniture, as well as bathing, cleaning and cooking. Even today locals trundle downtown to fill mop buckets, and in places, the water bubbles yellow with bags of steaming corn. Then, perhaps most famously, the volcanic soil is used to cook the island’s signature dish, Cozido das Furnas, which happens to be our lunch. After visiting the caldeiras we arrive at Furnas Lake just before midday to watch cozido pots being unearthed using long metal rods. Local restaurateurs devotedly lower the giant pots of meat and vegetables into the ground around 4am daily to ensure the stew is ready for lunch. We watch our food being bundled into a van then make our way to Restaurante Vale das Furnas to tuck in. The cozido is hearty and delicious, and quite frankly, enormous. I swear I’ll never eat again before predictably scoping out a good dinner option hours later. I start with a glass of Azorean wine along Ponta Delgada’s modern waterfront precinct before taking a local recommendation to try the island’s celebrated beef at Restaurante Aliança. A number of roads close to traffic at dusk, so I enjoy the warm evening from a table on the street, which is beautifully adorned with traditional Portuguese pavement of black and white stone. The waitress proudly presents a serve of soft handmade cheese with my meal, and gives a delighted grin as she clears my polished plate. So much for never eating again. As I return to my hotel I pass a local family taking an evening stroll. A boy of around nine skips towards me and calls “Hello! Do you like São Miguel?” He seems equally pleased to practise his English as he is to hear my response. “I love São Miguel,” I reply. As I bid them a good night, the boy’s mother tells me it is customary to make a wish as you pass under the basalt arches of Ponta Delgada’s city gates. As I cross the patterned cobblestones towards the elegant Portas da Cidade I wonder how many people wish to return. I certainly did. Extend your trip and visit some of the other islands in the Azores. São Miguel: The largest island and key transport hub for the Azores. Santa Maria: The first island to break the surface of the Atlantic, known as the ‘Yellow Island’ due to its dry climate and vegetation. Terceira: The second most populated island, nicknamed the ‘Lilac Island’ in reference to its hydrangeas. Graciosa: Called the ‘White Island’ for its white stones and white clay. Pico: The second largest island and Portugal’s highest mountain. Faial: Known as the ‘Blue Island’, also based on its plentiful hydrangeas. São Jorge: A mountainous island with excellent hiking. Corvo: The smallest island and a UNESCO World Biosphere Reserve. Flores: Named ‘flowers’ for its abundance of wildflowers. Getting there: Direct flights to Ponta Delgada operate from Porto and Lisbon as well as other destinations in Europe. SATA Airlines operates inter-island flights in addition to local ferry services. Eating there: Bar-Restaurante Aliança; Rua Açoreano Oriental 23 Restaurante Vale das Furnas.